Got this dress quite a while back to standby for family shoot.. Not sure why it doesn't have the flowy skater effect as compared to the photos shown during the launched. Kinda disappointed as its a bit A-line effect. 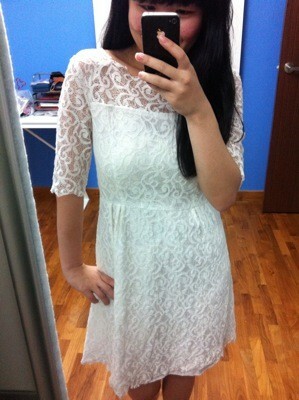 However, it's quite expensive as compared to the other lace dresses I have bought so far-- $41 excl mail. But I just can't resist myself! They still have it in black now..